When we read 1 Samuel 17 we surely need to see a fulfilment of Genesis 3:15 – the enmity between the forces of the Serpent and the forces of the LORD, a seed of woman who strikes the head of the seed of Satan (notice the emphasis on Goliath’s head – verses 46, 49, 51, 54, 57) – and a pointer forward to the perfect fulfilment in our representative who goes out (in weakness) to fight for us at the Cross while we stand helpless and quivering on the sidelines. But… surely, we might say, there is also an emphasis on David’s faith in this story of 1 Samuel 17? Surely his great speeches of confidence are supposed to inspire us to have such faith in God in all our trials? The danger here is that the idea of ‘faith in God’ becomes very vague. when we look at David, for example, we don’t say that he just had ‘faith in God’ in some vague sense. He didn’t exist in some pre-Trinitarian time. He was very conscious that he had the Spirit (Psalm 51:11) and spoke by the Spirit (2 Sam. 23:2), he was well aware of the difference between the Father and the Son (Psalm 110:1) and his Lord was specifically Jesus (Matt. 22:41-45). 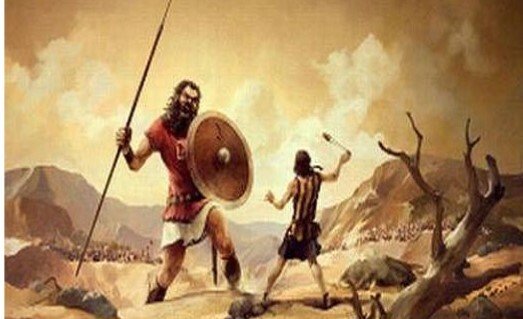 So if we were preaching on 1 Samuel 17 (David and Goliath) we would want to bring out the big point – that this is a pattern of Jesus’ victory over the Great Enemy, but we might also speak of David’s faith in the very-present Deliverer LORD (1 Sam. 17:37; 45-47) and make clear that this was faith in Jesus. David is a type of the Greater Christ to come but he is also already trusting in that Christ who is present with him to save. And then even this faith of David becomes typological – a type of Jesus’ faith in his Father. As the Great David goes out to face the Devil in single combat he goes for the glory of the Father (John 17:4) confident that the Father delivers the plunder into his hand (John 6:37-39; 10:29). An old question: Why does 1 Samuel 8 seem to be very negative about the idea of a king while Deuteronomy 17 seems to be fine about it and Judges seems to think the big problem is the lack of a king? You get two types of king in Deuteronomy 17:14-20: a) A king who is on the same level as his brothers, whose chief work is to daily read the Law so that he would fear God, keep and do the Law, and not be proud; and b) A king who accumulates stuff (“multiply for himself” x3) and sends the people back to Egypt. The people in 1 Sam. 8 want a king like the kings of the nations around. Samuel explains what that sort of king is going to be like: v11-18 – he will be a taker (“he will take” x6) who will make himself and his aggrandisement the big project (“his” x9), basically enslaving you until you cry out like you did in Egypt (v17-18). But the people don’t care – there’s a sense in which that’s exactly what they want. They want a Big Man. The LORD God says in choosing the world’s Big Man model of leadership they are rejecting him as king (v7). They are doing what they’ve always done, “forsaking me and serving other gods” (v8). Notice the connection between choice of deity and choice of king. The LORD God is not a Big Man-type leader. He isn’t a taker, he’s the giver. He isn’t an oppressor, he’s the liberator. He doesn’t make people serve his power agenda, he stoops to serve. But the Israelites (like we all naturally do in our perversity) want cruel tyrannical Big-Boss-In-The-Sky gods. And the LORD says, that rejection of the true servant God and turning to tyrannical idols is now being played out at the human level: “so they are also doing to you (Samuel)” (v8). Samuel is the good leader of Deut. 17 – governing Israel by the Word and prayer (e.g. 1 Sam. 7 & 12). He is the servant leader who can say to the people, “What have I taken? Whom have I oppressed?” (1 Sam. 12). What we need is what we don’t naturally want – The Servant King who perfectly fulfils the patterns of the Law and the Prophets: our Elder Brother who gives himself, who serves us, who sets us free. And second, we need servant leaders like Him – who are Word-driven, loving, obedient, serving, humble.